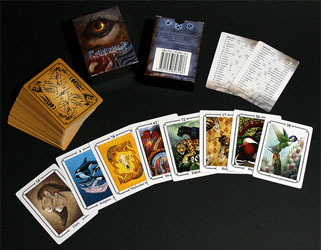 Each deck includes the Pathfinders totem CD, it’s easy to use; it has autoplay under Windows (or under a Windows emulator on the Mac) It has the guide, detailing the meaning of each animal. I also included 4 basic tarot spreads and explain, step by step, how they can be used with the Pathfinder totem cards. Shipping within the Netherlands is € 6,75. Shipping within Europe is between € 9,00 and € 12,00 without track&trace. Shipping within Europe is between € 13,00 and € 19,30 with track&trace. Shipping outside of Europe is € 18,00 without track&trace, € 24,30 with track&trace. Please contact me for an accurate estimate. I cannot take responsibility for packages without track&trace that are lost in transit. For payments from Dutch people I prefer a direct bank transfer, people outside of the Netherlands will have to use Paypal. If you’d like me to sign anywhere (the actual card, back, front, index, card box), please let me know. And keep it mind it means I’ll have to remove to wrapper to do so. You won’t get a used deck, but you will get an opened deck. There’s a limited amount of Pathfinder decks, so get ’em while you can!